Happy Monday! What time is it? Well, I had every intention of writing this post and pushing it live by 9:30 this morning before I began work cleaning out my desk. Well, I woke surprisingly early despite daylight savings and completed my morning workout, then headed to make the boys lunch for today. But wait…no bread!!!! Arrrrrggg!! So I tell them both that I will pick up bread when I run to grocery shop and then drop off their lunches. I run my errands and drop off the boys lunches then I go to make their beds (yup, I’m back to making them on weekdays because they will never get out on time) and realize they didn’t wash their sheets this weekend so off the sheets must come and of course my planned 2 loads of clothes today must be bumped back to wash sheets. Ahhhh!! I almost made matters worse by boiling some eggs for a late morning snack when I realized it was Meatless Monday. Luckily I remembered so this morning has not been a complete epic fail! Hmm and you wonder..is it a happy Monday? I still am very happy for I have so many things to be grateful for. Our renovations are coming along. Slowed by the scheduling of the carpet installation but this gives us more time for the painting. The crown molding is complete and taped for painting to begin. I had been working in my living room for the past week and missing my craft room dearly. So today I decided to clean my desk and block out all the furniture, books, mattress etc. that has invaded my craft oasis. So after the clean, I sat down to write to you. I am also tickled because I get to spend the entire upcoming Saturday from morning until night with my crafty girlfriends. It’s been too long indeed! 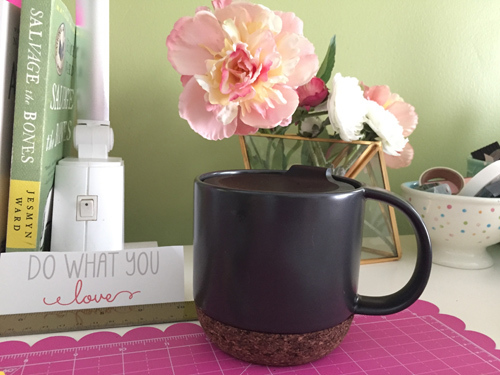 I am also happy for the cute tea mug you see in the today’s photo. I had been eyeing it at the Starbucks in Target until I finally go to buy it today and it was sold out. Luckily my town seems to breed Starbucks so I drove to the next one which is literally less than 5 minutes away and picked up this beauty. Now, any of you that have read more than a few posts on my blog know my love affair with tea and all things to do with tea. So this mug is making me smile right now. Don’t you love the cork bottom? No dishwashing but I don’t mind. The size fits perfectly in my hand and I love the lid. Bumped to my new favorite right now. I must go because now that I have a clean desk, I still work catch up on before pick up.